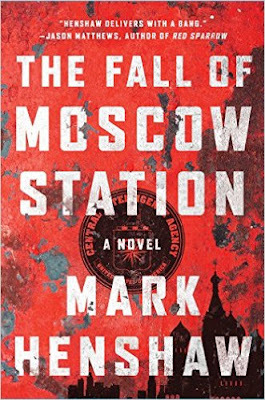 Veteran journalist and author Joseph C. Goulden offers a good review in the Washington Times of Mark Henshaw's The Fall of Moscow Station. Although a primary purpose of a counterintelligence unit is the apprehension of enemy spies, an equally important function requires a bit more sophistication: throwing handfuls of destructive sand into the gear boxes of a rival espionage agency. Such is the climax of a sparkling spy thriller by CIA veteran Mark Henshaw, whose insider point of view adds authenticity to a yarn that, to me, evoked memories of the late Tom Clancy. The story builds (roughly) on two real-life events in recent intelligence history. One was the defection to the Soviets of CIA officer Edward Lee Howard in September 1985, after he had been trained in highly secret “Moscow Rules” — the tradecraft used by the CIA station in Moscow. Note: My interview with Mark Henshaw will appear in the upcoming issue of Counterterrorism magazine. I'll post the interview here when the magazine comes out.